There's nothing I can really add to the legend of the 1980 US Olympic hockey team, so I'll spare the talk about how a group of American college kids stunned the best team in the world on this day (Feb. 22) 30 years ago. All I'll say is that I fell in love with hockey during the 1980 Olympics and wanted more than anything else in the world to learn to play it. Unfortunately, that wasn't a possibility in the Dallas-Fort Worth of the 1980s, so (long story short) I ended up taking my first skating lesson just last year. Regardless, I still love hockey, and now I get to watch it live all the time. Living in New England does have its advantages. 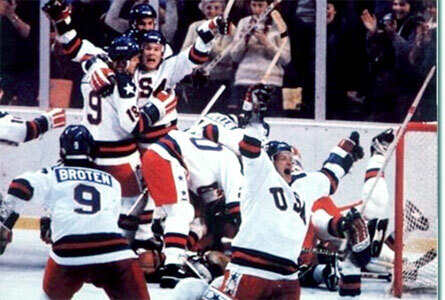 What I can't believe is that the Miracle on Ice happened 30 years ago. I was six at the time, but I have to say that I was a fairly smart six. I read the newspaper fairly regularly back then (seriously) and watched the evening news every night with my dad. I had a basic idea of what the Soviet Union was, why the USSR was our rival in both politics and sports, and why it would be such an incredibly big deal if our amateurs could beat the Soviets, the best team in the world. I also knew that times were tough in 1980. I was aware of the Iran hostage crisis and was even more acutely aware of the sagging economy. My family struggled financially in the late '70s and early '80s (as many did) before my dad landed a job that would essentially pay for much of my college education and allow my parents to retire fairly comfortably. Back in 1980, though, there was a lot of uncertainty about a lot of things, even at home. So, in a simple way, I got it when the US beat the Soviets and then went on to beat Finland for the gold medal. I got why it meant so much to us as a nation. And I know that the greatest moment in sports history, period--which I still believe the USA's 1980 run to be--will never happen again, now that professionals have invaded the Olympics (and maybe rightly so). But how on earth have 30 years gone by since the Miracle on Ice? Three whole decades! I'm not supposed to be old enough to remember things that happened 30 years ago, but I do remember...and I remember well. I see the old TV clips of the USSR game now and remember how primitive TV was back then. To my memory (and I could be wrong about this), ABC didn't even show the USSR game live--it showed it on tape delay, which didn't really matter because most people didn't know how the game had finished, anyway. Back then, if we missed a live sporting event, we had to watch the evening news or wait for the next day's paper to find out what had happened. Strange days indeed. And very far away, it seems. After the US won the gold medal, I dragged my mother to Lord & Taylor, where she bought me a cotton "USA" long-sleeved t-shirt replica of the hockey team's jerseys. I also remember having a winter vest with a 1980 Olympics patch on it. I kept the patch for a long time, at least into my 20s--and I might still have it in an archival box somewhere. I should probably take a look one of these days. What I definitely have is memories of the defining sporting event of my lifetime (and maybe of anybody's lifetime) and a realization that Willie Nelson was incredibly prescient when he sang, "Gee, ain't it funny how time slips away." It is, Willie. It is. Thirty years...and I still well up a little bit when I see Mike Eruzione score. I'll bet most Americans my age or older do, too.